Contrary to what you may have heard the origin of Kurobuta Pork can be found in 17th century England, not Japan. The breed was first discovered by Oliver Cromwell’s army as they wintered in Reading, the county seat of the Shire of Berks where the breed earned its name “Berkshire”. The legend of the Berkshire breed grew as the men shared their stories of the rich, succulent, juicy pork they enjoyed that winter. In the 1800’s, as a gesture of diplomatic goodwill, a gift of pure bred Berkshire animals was given to the Japanese emperor. This breed soon became the breed of choice in Japan where it was refined and renamed Kurobuta. Kurobuta means “Black Hog” after the unique natural coloration of the breed. 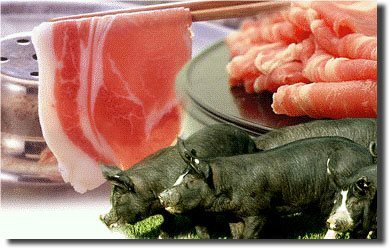 Austin Meat's production partners have been passionately involved in producing Kurobuta Pork for the Japanese market for more than 10 years. Over that time our production methods have been refined and today we are proud to produce the most flavorful, succulent, and consistently delicious pork available!